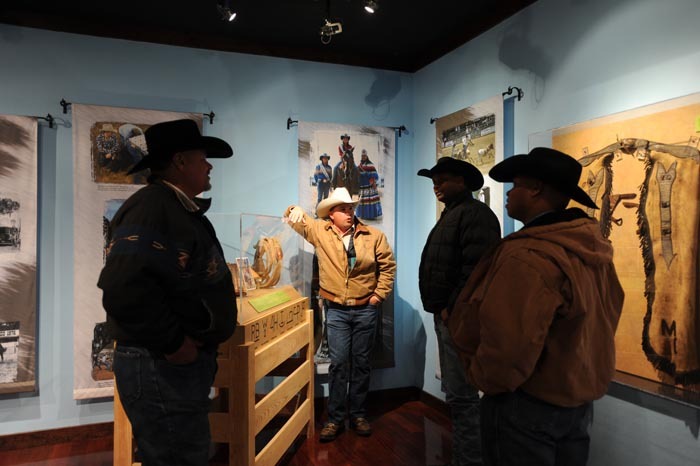 This afternoon inside the Western Folklife Center in the Wiegand Gallery, a gallery opening will be held for the Florida Cattle Ranching: Five Generations of Tradition exhibit. If you are a Western Folklife Center member or a stakeholder, the opening begins at 3:30 PM. The general public is invited to attend the opening at 4:15 PM. If you attend the gallery opening or if see the Cracker cowboys and our Florida guests walking around town this week, here are some questions that you might consider asking them. Seriously, how big are the alligators? Is the word Cracker from the word Quaker or is it from the sound the Cracker whip makes? Have you ever been bitten by an alligator? How do the cattle behave when there is a hurricane? What do you do? What does swamp cabbage taste like? To get the cabbage, do you have to get into the swamp… with the alligators? Do you bale hay in Florida or do you have lots of permanent pasture and lots of water? Can you use swamp water for irrigation? The Cracker cow, what breed is it and how is it related to the Texas Longhorn? What does alligator taste like? Chicken? How is a Cracker whip different from a bull whip? Is it true that the Florida State University Seminoles were almost called the Florida State University Crackers? Are you enjoying your time here in Elko? You know, we don’t have alligators or hurricanes here, but you might want to watch out for badgers and wait five minutes for the weather to change. If you have the opportunity, please be sure to welcome all of our Florida guests. I’ve personally met most, if not all of them. They are all very kind and very friendly.